Whether it’s a playful paddle in the lapping waters of a Kilkee rock pool, surf’s-up time in Lahinch or a lazy lake dip at Killaloe – choose Clare to keep you in the swim of things. From rugged coastline to the magical stories of traditional music, you don’t have to look hard to feel the romantic warmth and soul of County Clare. But as much as it’s an emotional experience, so is it one of quality and the kind of exceptionally high standards that have made us a world destination of choice. Take a glass of our much-loved Guinness for example: pouring the perfect pint of the black requires adherence to a strict set of criteria – from being able to complete the perfect ‘2 Part pour’ to making sure the head stands proud of the rim. But what you may not know is that the same combination of magic and quality is true of the many beautiful beaches in Clare – and we’re proud to say that no less than 9 of our beaches have met all criteria necessary to be given the much sought-after Blue Flag Status. The Blue Flag is awarded in Europe, Africa, Asia, North America and South America to beaches that represent the highest standards of water quality, education and information about the beach, environmental management as well as safety services and facilities. To be awarded a Blue Flag a beach has to meet 23 imperative and four guideline criteria, while marinas require compliance with 19 imperative and four guidance criteria. It’s no small feat then that in 2015, Clare beaches received a record number of Blue Flags. All of this means that wherever you choose for some sand, sun and swimming – you can be sure of a safe, top quality, world-class beach experience. Beyond Blue Flag recommendations, what also make Clare’s shores so compelling is the sheer diversity, beauty and natural wonder of our coastline. Ours is a sea board that resonates as much with the soul as it does with the sports enthusiast and swimmer in us. So whether a lone walk on soulful sands with the waves crashing behind you is your idea of beach heaven – or you’re looking for premium water sports – or you’re simply longing for that nostalgic, authentic sandcastle and rock pool family holiday to recharge and reconnect – you’ll find Clare beaches tick all the right boxes. From quiet, secluded coves to buzzing seaside life, Clare has it all – but if you’re looking for the ultimate, all-in-one swimming and beach experience, it’s got to be Lahinch in North-West Clare. Since the days of the Old West Clare railway system, Clare holidaymakers have flocked to the Lahinch shore which is today recognised as one of Ireland’s finest beaches and a hot spot for all the excitement and action of surfing. A traditional promenade provides a perfect walkway and viewing point out to sea, while the strand itself is an endless strip of beauty and hidden treasures, just waiting to be explored by eager kids and us grown-ups who are ready for some serious down-time. This large, crescent-shaped sandy beach is a prime spot for swimming – offering secure fun for kids and peace of mind for adults as it’s lifeguarded for safety. It’s the kind of swimming beach that Irish summers were made for – as long, sunny days stretch into the soft, late afternoon light. Refresh and invigorate mind, body and soul with an early morning plunge – then spend the day making the best of beach time magic. 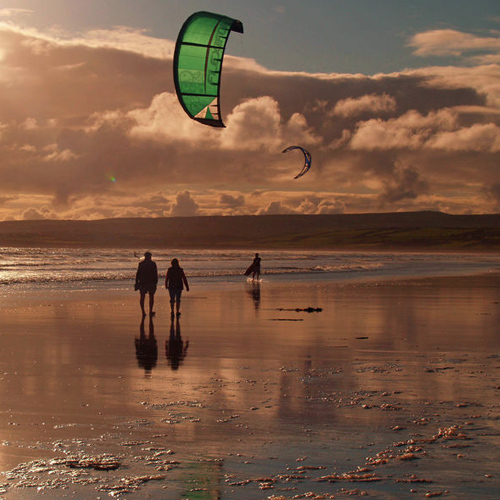 Later, take a stroll, enjoy an ice cream and explore the rocks and boulders of Lahinch while you’re entertained by every water sport imaginable – from surfing, kite-surfing and wind-surfing to water-skiing and sailing. Visit once and we promise you’ll be back. 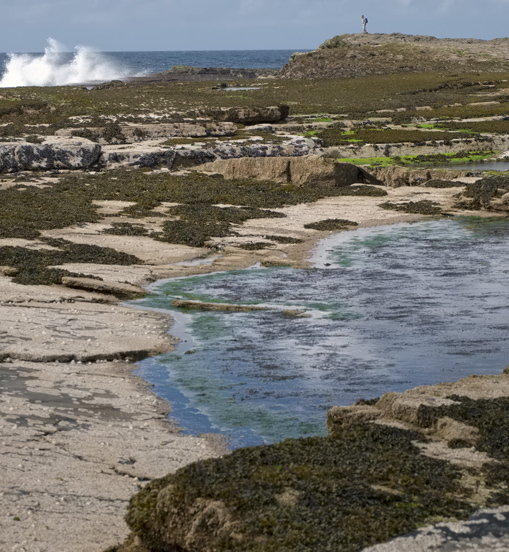 Further along the coast, between Milltown Malbay and Quilty, Spanish Point is another Clare gem that has a beautiful combination of long, lazy golden sands, Blue Flag swimming waters and top surfing action as the high waters roll in from the Atlantic. Here swimming is supervised in the season and family-friendly beaches can be found all along the coast. If a quieter beach experience and the chance to shoot the breeze and re-energise the soul is more your thing – you might want to take in the beauty of Whitestrand beach – just off the N67 road to Lahinch. It’s a small, sandy beach with a rocky shoreline and offering a gentler beach mood together with some really great swimming. 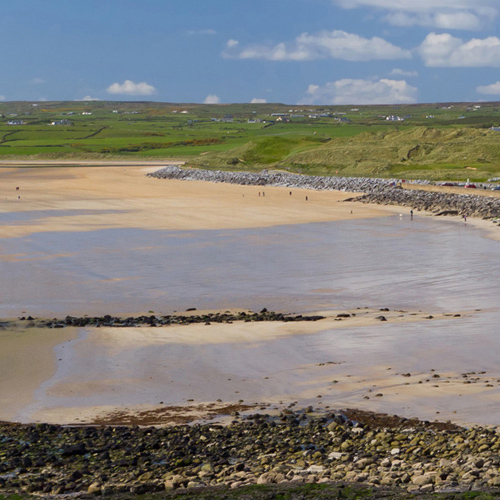 Further up the coastline past Doolin in North Clare, is Fanore Beach offering paddling for smaller kiddies, swimming for older children and adults and the unique splendour of golden sand-dunes. Apart from a great water-life, this beach is also known for its unique flora and fauna – which introduces another wonderful element of natural beauty and discovery to a beach holiday here. Whether you’re running, walking, swimming, playing, fishing or simply kicking back on the shore – Fanore’s unspoilt beauty and unhurried, soulful charm is sure to move you. 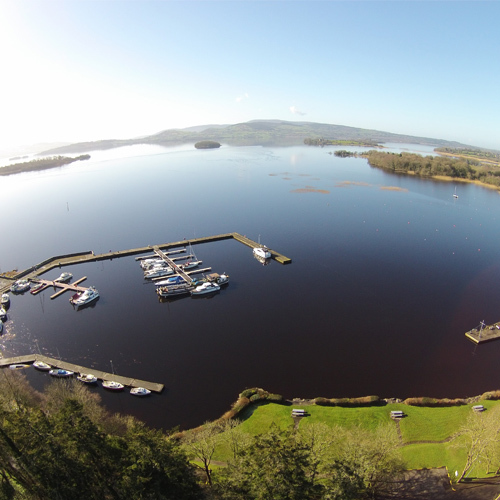 Typical of Clare’s contrasting landscape and splendour, the county also offers a range of freshwater swimming destinations – not least being the incredible Mountshannon on the Lough Derg Nature Trail. This exceptional beach is a small, lakeside bathing area located at one of Ireland’s major freshwater lakes of Ireland – Lough Derg. An outstanding pleasure lake, it features over 179 km of indented shoreline and is famed for its natural beauty, picturesque charm and romantic heritage. You can get to Mountshannon via the R352 from Scarriff or the R352 from Ennis – and once there you’ll find the perfect setting for calm and relaxed swimming and picnicking in lakeside splendour. For added safety, the beach is lifeguard patrolled during the bathing season. To add to the lake experience there’s also a bustling pier and beautiful marina – making Mountshannon so much more than just a venue – it’s a whole lake lifestyle. You should also remember that this spot is situated on one of Ireland’s premier nature trails – a natural haven for wildlife with exceptional bird watching, hiking and adventuring. 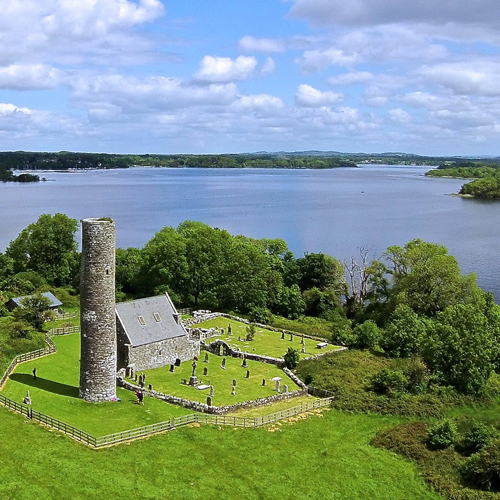 Lough Derg is also home to Ballycuggeran freshwater beach, situated near Killaloe. Of course not every day is going to be ideal for outdoor swimming – but this doesn’t mean the kids are disappointed or you have to do without your morning lengths. In a bid to deliver a total experience, Clare has a number of top-quality, beautifully appointed and maintained public, indoor, heated swimming pools. Pools at Lahinch, Shannon and Kilkee are all worth checking out – while the Ennis Leisure Complex offers a 25m swimming pool and kiddies’ pool along with a state-of-the-art gym, saunas and steam rooms. So make a day of it! If any or all of your Clare experience includes a stay at one of our fine, world-class hotels – don’t forget they’re well-equipped to offer you the ultimate in indoor swimming experiences too. Treacy’s West County Hotel in Ennis has a splendid, 20 metre deck pool with up to 4 swimming lanes – as well as a kiddies’ pool to keep all happy. Something different comes in the fine form of Dromoland, Newmarket-on-Fergus – a stately hotel set in a castle that dates back to the 5th Century, offering unashamed luxury. The indoor pool is the perfect place for swimming in style – just one of the many facilities in the hotel’s grounds that include fishing, clay shooting and a golf course. The Inn at Dromoland offers alternative accommodation with its own on-site swimming pool. A gem of a South Clare experience is undoubtedly Bunratty Castle Hotel – its stunning pool with hydro therapy jets taking your swim to a whole new level. Then over in East Clare, the Lakeside Hotel at Killaloe has an 18 metre, deck level pool that’s just the thing for the serious swimmer – with an exciting, 40 metre, figure-of-eight water slide for some fabulous family fun. When it comes to swimming – choose Clare and the choice really is yours. So come on in – the water’s lovely!